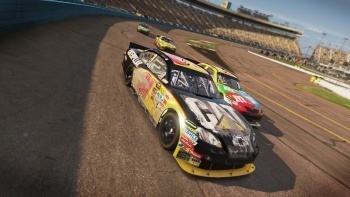 Activision and Eutechnyx are bringing the thunder with an all-new NASCAR racing game scheduled to come out next year. NASCAR The Game 2011 is the first NASCAR racing game to be released since EA Sports put an end to its NASCAR franchise in 2008. The new game will let players drive as themselves or as a real-world stock car racer as they battle it out for the Sprint Cup Series Championship on 22 official tracks. Computer-controlled drivers are programmed to emulate their flesh-and-blood counterparts, while gamers after a more unpredictable challenge can take part in online races with up to 16 players. In both modes, drivers can earn experience points that will unlock decal packs, special car designs and, in career mode, sponsorships and special races. There's even an "interactive celebration mode" for victories, although no indication was given as to what that might actually mean. "It was crucial to take a fresh look at what makes the sport so popular," said Ed Martin of Eutechnyx, which is developing the game. In an unusual twist, NASCAR signed its new licensing deal directly with the studio rather than the publisher; Activision is only distributing the game. "We're working very closely with NASCAR, the drivers, the teams, the tracks and the sponsors to get all the minute details right, and give this game the polish and push the fans deserve." Hopefully the "fresh look" will give Eutechnyx some fresh ideas about how to make a NASCAR game with something approaching broad-based appeal. The difficulty that's plagued all such games in the past is that driving a stock car around an oval track can get awfully dull, awfully quickly. I appreciate the fine art of drafting and the nuances of pit strategy as much as the next guy, but a realistic racing experience doesn't necessarily translate well into videogame format. But Martin said that creating a pure arcade game isn't the answer either. "There have been times where there were 'over-the-top' games like NASCAR Rumble and even NASCAR Kart, but there is a real disconnect there because those games don't represent the real sport. You can't go off too far off the path," he told ESPN. "At the same time, you can't get too sim-y. We want you to jump right in and have fun. If you turn off all the assists in our NASCAR game, this is a very real - as close as you can come to a simulation on a console - but at the same time, with the assists turned on, this is a very fun, approachable game for the common NASCAR fan. " The first official trailer for the new NASCAR racing game will debut on Speed at 10 am EDT on October 3. NASCAR The Game 2011 is scheduled for release in February 2011 for the Xbox 360, PlayStation 3 and Wii.